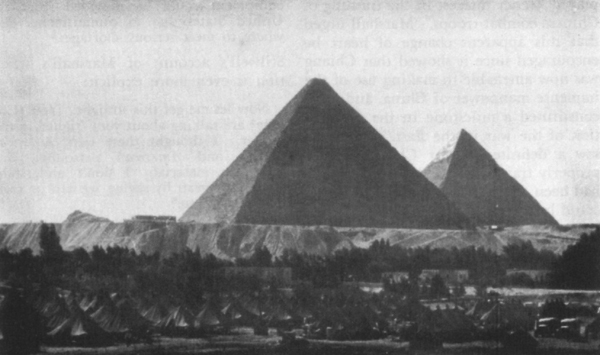 Reaching Cairo early in the morning of 22 November, the President and his party found that Generalissimo and Mme. Chiang Kai-shek and a small Chinese delegation, as well as the Prime Minister and his large staff, had arrived a few days ahead of them. The U.S. delegation was driven to the conference area located on the outskirts of Cairo not far from the pyramids. Here, behind a barrier that bristled with barbed wire and heavily armed sentries, lay Mena House, a hotel named after the first ruler of the first Egyptian dynasty. The hotel itself was fairly small, but some thirty-four surrounding villas provided comfortable quarters for members of the conference. Plenary sessions were held at the President's villa; military staff meetings were held at Mena House. On hand were Generals Stilwell and Chennault and Lord Louis Mountbatten, the Supreme Allied Commander, SEAC, and General Wedemeyer, his deputy chief of staff. With little ado, the Combined Chiefs of Staff got down to business on the afternoon of the 22d. The opening days of SEXTANT-the American-British-Chinese phase-saw the Anglo-American staffs in daily session from 22 through 26 November. The Chinese staff participated in some of these discussions. Two plenary meetings were also held-one on the 23d attended by the Prime Minister, the President, the Generalissimo, and their staffs, and the second on the 24th at which the Chinese were not present. The first meetings at Cairo between the U.S. and British delegations were concerned mainly with prospective operations in the Far East and Europe. Though no conclusive strategic decisions were reached, these opening debates revealed the lines of conflict emerging and pointed up the terms under which the basic choices had to be made. MENA HOUSE, scene of military staff meetings during the Cairo conference. THE PYRAMIDS, background setting for Mena House on the outskirts of Cairo. central Burma and along the Arakan front. In the meantime, the Ledo and Yunnan Chinese forces would move forward and attempt to link up in the neighborhood of Bhamo in northern Burma. Each of the three advances would be supported by one of Wingate's long-range penetration groups, which would be supplied by air. There would also be an amphibious phase, but for security reasons the Chinese were not informed of the proposed target, the Andaman Islands (code name BUCCANEER. Except that its goals were more limited, CHAMPION differed little from its predecessors. GENERALISSIMO CHIANG KAI-SHEK AND MADAME CHIANG seated with President Roosevelt and Prime Minister Churchill at the Cairo conference. 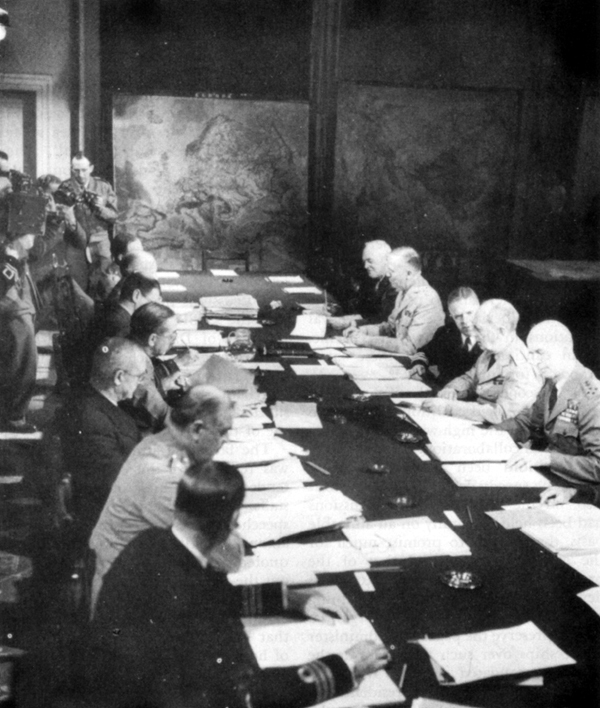 Standing from deft: General Shang Chen, Lt. Gen. Lin Wei, Generals Somervell, Stilwell, arid Arnold., Sir John Dill, Lord Louis Mountbatten, and Lt. Gen. Sir Adrian Carton de Wiart. As might be expected, the specific issue in European strategy under discussion was OVERLORD in relation to the Mediterranean. At the plenary session on the 24th, the President stated the problem before them as essentially one of logistics-whether OVERLORD could be retained "in all its integrity" and, at the same time, the Mediterranean be kept "ablaze." Stalin would almost certainly demand continued action in the Mediterranean as well as OVERLORD. Future action in the eastern Mediterranean seemed to depend on the entry of Turkey into the war. This, too, would have to be discussed with Stalin. Churchill drew a doleful picture of the events of the last two months in the Mediterranean, contrasting it with the long series of world-wide Allied successes over the past year. In Italy the campaign had flagged. With a heavy heart he had agreed to the transfer of the seven divisions from the Mediterranean to the United Kingdom. The Allies had not taken advantage of the open Adriatic coast to bolster the guerrillas and promote chaos in the Balkans. Moving to the Aegean, he particularly lamented the loss of the Dodecanese Islands -"cheap prizes" that lay open to the Western Allies upon the collapse of Italy. It was clear that he was still after Rhodes and was chagrined at the reverses recently suffered by the British in the Aegean. It was his hope that the Russians would agree on the importance of bringing Turkey into the war. The effect on the Balkan countries-Hungary, Rumania, and Bulgaria-would be great. Once Turkish airfields were at Allied disposal and Rhodes recaptured, the other Dodecanese islands would soon fall to the Allies. Stepped-up aid to the Yugoslav patriots need not involve a large commitment of troops and supplies. He emphasized that in Italy the British had no thought of advancing into the Po Valley. The main object was Rome. Whoever held Rome held the "title deeds to Italy," and, with Rome recaptured, the Allies could seize the landing grounds to the north. Only a limited objective, the Pisa-Rimini line., should be the goal of the Italian campaign. When these objectives in Italy had been reached, the time would come to make the decision "whether we should move to the left or to the right." Turning to OVERLORD, the Prime Minister emphasized that he had not weakened or cooled toward it. Nevertheless, as he saw the problem, the timing would depend more on the state of the enemy than on the "set perfection of our preparations." He went on to say that "OVERLORD remained top of the bill," but "should not be such a tyrant as to rule out every other activity in the Mediterranean." Thus, a degree of elasticity should be permitted in the use of landing craft; the scheduled transfer of landing craft from the Mediterranean for OVERLORD should be deferred for a few weeks. He summed up his program: Rome in January; Rhodes in February; supplies to the Yugoslavs; a settlement of the command arrangements; and the opening of the Aegean, subject to the outcome of an approach to Turkey. All preparations for OVERLORD should go ahead "full steam" within the framework of this Mediterranean policy. Although the British proposals for Mediterranean action ran counter to U.S. staff notions of the paramount importance of OVERLORD, the JCS "tentatively" accepted them with little debate as a basis for discussion with the Russians. But to safeguard U.S. interest, the Americans obtained British assent to a number of precautionary commitments. The JSSC had particularly urged two commitments in order "that the British be not allowed to use the Soviets to advance their ideas concerning the eastern Mediterranean areas and the Balkans at the expense of OVERLORD. "19 First, the Americans and British would have to come to an agreement on how to answer any Soviet proposal involving major operations through the Balkans or the Aegean. Secondly, the common Anglo-American policy to be adopted toward Turkey should include support of a Soviet proposal to force Turkey into the war only if no troops or supplies would be diverted to Turkey at the expense of approved operations elsewhere.20 Also, Marshall made clear that American acceptance of the British proposals was subject to the understanding that the U.S. Chiefs of Staff did not thereby assent to the abandonment of BUCCANEER. Marshall's insistence 'on this last point led Sir Alan Brooke to point out that if the capture of Rome and Rhodes and Operation BUCCANEER were carried out, the date of OVERLORD would have to be postponed. Marshall replied that he quite understood.21 To accept the British 'proposals did not mean that the U.S. staff was undertaking to defend them. Far from endorsing them, the action of the Americans merely underscored the fact that they were postponing final decisions until the Soviet views could be heard and taken into account. Although ostensibly the debate on operations in the Far East revolved about the question of amphibious operations in the Bay of Bengal, basically the dispute resolved itself into a question of determining the future military value of China. The long-existent British feeling that the Americans overrated both the Chinese potential war effort and China's worth as a base for operations came into direct opposition with the U.S. policy of maintaining China in the war and eventually employing both its manpower and its bases. So long as the British were not called upon to make a strong effort to support China, a compromise could possibly have been made, but the Americans were now pressing vigorously for a major operation in the Far East as well as concentration of the precious resources for the invasion of the European continent in force. The future role of China in the war hung upon the outcome of the dispute. At this point in the proceedings-with issues in Asiatic and European strategy unresolved-the Americans and British moved to Tehran, where a fourth power, the Soviet Union, was to cast its weight on the planning scales. On 27 November the President and the Joint Chiefs and the Prime Minister and his chief advisers departed separately by air and along different routes for the historic meetings at Tehran-a conference within a conference. Tehran, capital of Iran, lying within a vast horseshoe of snow-capped mountains, was a meeting place of East and West. Ancient and picturesque, the city was surrounded by earthen ramparts and a moat. Twelve arched gates provided entry into the center of Tehran, where traditional bazaars and modern shops, plodding burros and lend-lease trucks presented a sharp contrast. In this city that blended the old and the new, the Big Three held their first meeting. Since the U.S. Legation at Tehran lay outside the city walls and was regarded as unsafe for Roosevelt, Stalin offered the President the hospitality and security of the Soviet compound within the city. Admiral Leahy stayed with the President at the Soviet Legation. 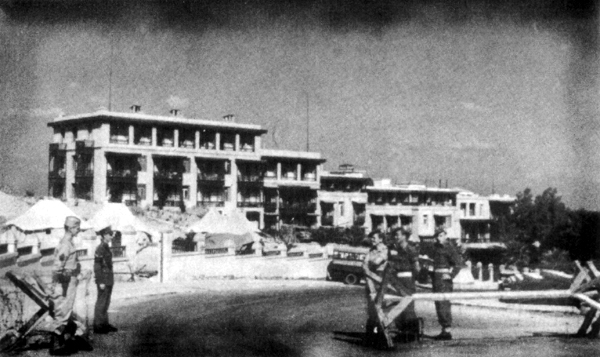 The other military members of the party were quartered at Camp Parker, headquarters of the Persian Gulf Service Command, outside the city walls. Churchill was lodged at the British Legation in the city. and Arnold, the Army was represented at Tehran by Generals Somervell, Handy, and Deane, the latter temporarily recalled from his Moscow post. Also in the American delegation were Hopkins, Harriman, Admiral Cooke, and Charles E. Bohlen, who was to act as an interpreter. THE BIG THREE IN PORTICO OF THE SOVIET LEGATION, TEHRAN. Seated on left is Marshal Joseph Stalin. Standing from left: Harry Hopkins, Vyacheslav M. Molotov, W. Averell Harriman, Sir Archibald Clark Kerr, and Anthony Eden. To the Tehran conference (coded EUREKA Stalin brought a small staff including Molotov, Marshal Voroshilov the sole Soviet military delegate-and Mr. Pavlov, an interpreter. Three formal plenary sessions were held at Tehran in the Soviet Legation by Roosevelt, Churchill, Stalin, and their staffs on successive days beginning 28 November. There were also a number of less formal and more purely political discussions among the chiefs of state.29 On the 29th the CCS sat down around a conference table in the Soviet Legation for a purely military conference with the Soviet military representative; on the both the CCS met by themselves. point, General Marshall observed that it boiled down to undertaking the Rhodes operation in lieu of the Andaman operation.30 The Prime Minister, he believed, "would use every wile to cut out BUCCANEER." The President replied firmly, "We are obligated to the Chinese to carry out the amphibious operation BUCCANEER." Considerable means, General Marshall went on to say, would be "sucked in" for Rhodes and other Aegean operations and undoubtedly would result in an unacceptable delay to OVERLORD. Furthermore, he reported, General Somervell believed that, even if Turkey entered the war, it might be six or eight months thereafter before the Dardanelles could be opened, since it would take considerable time to shift bases in order to undertake operations in the Aegean. As for other Mediterranean activities, Marshall thought more could be done for Eisenhower in Italy and for Tito's forces in Yugoslavia, within limits. Still there must be no undue delay in OVERLORD. The President revealed that he was much more favorably inclined toward operations from the Adriatic than from the Dodecanese. Shipping and landing craft, all agreed, were the bottleneck. The President commented that the Russians must be informed that American production of landing craft amounted to just so much per month and that all of it was earmarked for definite operations. Whenever one operation received additional landing craft, shortages were created elsewhere. No pool was available. General Marshall also observed that the British had stated that they could not decide about BUCCANEER versus Rhodes until after they had talked to the Soviet authorities. The British did not feel that they should be pressed to carry out an operation for political reasons until the military considerations were proven to be sound. this table for the first time as a family, with the one object of winning the war. "33 The Prime Minister also rose to the occasion. He called attention to the concentration of great worldly power represented at the conference table and said that in their hands lay "the future of mankind." Stalin replied appropriately, but briefly, and then, with characteristic bluntness, said, "Now let us get down to business." The President began the business part of the meeting with a general survey of the war from the American point of view. He dwelt first on the subject of the Pacific, which, he observed, affected the United States more than Great Britain or the USSR. The United States was bearing a major share of the Pacific war. The greatest part of U.S. naval power and about a million soldiers were in the Pacific. American forces had been moving forward toward Japan from the south and currently through the islands from the east as well. In the north there was little more they could do. To the west of Japan, it was necessary to keep China actively in the war. In general terms he set forth the plans for operations through north Burma and into Yunnan Province and noted the fact that still in the discussion stage were plans for "an amphibious operation." Not only was it of the greatest importance to keep China in the war but also to get at Japan as quickly as possible. He then came to the subject of operations of immediate concern to the USSR and Great Britain. In the past, largely because of transportation difficulties, the Western Allies had been unable to set a definite date for plans to cross that "disagreeable" body of water, the English Channel. They still wanted, and firmly intended, to cross it, but they could not do everything they would like in the Mediterranean and also from the United Kingdom. There was a definite bottleneck in the matter of landing craft. Certain operations contemplated in the Mediterranean would result in a delay of one to three months in OVERLORD; if any large expedition were launched in the Mediterranean, OVERLORD would have to be given up. Several possibilities for the Mediterranean presented themselves: an increased drive into Italy, an operation from the northeast Adriatic, operations in the Aegean, and operations from Turkey. But, if possible, OVERLORD Should not be delayed beyond May or June. The Prime Minister interpolated that there were no differences between U.S. and British points of view except as to "ways and means." The President and the Prime Minister both stated that what was now needed was Soviet opinion on how the Western Allies could be of greatest help to the USSR. been forced to capitulate. "Then by our common front we shall win." This official declaration regarding Soviet intentions in the Pacific war-the first assurance given by Stalin directly to the other two chiefs of sate-was most heartening to the Americans. From early in the war, the President and the American staff had been hoping the USSR would enter the conflict against Japan. Stalin's announcement instantly eliminated the problem of the best way to bring up the question that had been troubling the President and General Marshall. How important the immediate by-products and subsequent effects of that declaration on coalition strategy and U.S. planning would prove, only the future would show. Following the Soviet pledge, the remainder of the military discussions focused on the European conflict. Stalin bluntly proceeded to set forth his stand on operations in Europe. He put the weight of Soviet opinion behind OVERLORD, supported by a southern France operation. A large offensive from one direction was not wise. Soviet experience over the past two years had shown the value of converging pincer operations of the type represented by simultaneous operations in southern and northern France. These operations would best help the Soviet Union. The Prime Minister drew on all his eloquence and marshaled all his arguments for Mediterranean - especially eastern Mediterranean-operations that would help the USSR "without delaying OVERLORD more than a month ox two." Twenty divisions that could not be moved out of the Mediterranean because of a shortage of shipping could be used to stretch Germany to the utmost. At one point the President helped Churchill's argument by expressing the belief that "possibly an entry through the Northeastern Adriatic for offensive operations against Germany in the direction of the Danube would be of value." Marshal Stalin was adamant. He did not favor scattering the Allied forces in the Mediterranean. The Allies should be prepared to remain on the defensive in Italy. He now had no hope of Turkey's entering the war. All Mediterranean operations other than southern France should be considered diversionary. The meeting of the 28th ended with Churchill still not completely convinced, but the clear hard fact remained that the Soviet Union had seconded the American case for OVERLORD. Henceforth, the Prime Minister would be fighting a losing battle for secondary operations in the eastern Mediterranean. The purely military phase of the discussions on OVERLORD and the Mediterranean was continued at the meeting of the representatives of the three military staffs on the morning of 29 November.35 Sir Alan Brooke took the opportunity to elaborate on the case presented by Churchill. Speaking for the United States, General Marshall first set forth the American point of view of this stage of the war. He explained that the United States now had a war going on two fronts-the Pacific and the Atlantic and that presented "a dilemma." In contrast with the usual difficulties in war, there was no lack of troops or supplies. In fact, there were now more than fifty divisions in the United States that the Americans wished to deploy overseas as soon as possible. The military problem resolved itself almost entirely into a question of shipping and landing craft. By landing craft he meant in particular special craft to transport motor vehicles and tanks. "While this is, of course, an exaggeration, it might almost be said that we have reached the point of having to ignore strategy in order to advance communications." He emphasized the deep American concern over such logistical problems as the length of voyages, the length of time required in ports, and the over-all time for the turnaround. U.S. air forces had been sent overseas just as soon as they lead been trained, and hence the air battle was far more advanced than that on land. One of the most compelling reasons from the beginning for favoring OVERLORD was that it represented the shortest overseas transport route. After the initial successes, transports would be sent directly from the United States to the French ports. Marshall stated that the question then before the conference was what to do in the Mediterranean in the next three months and in the next six months. To decide the question of Mediterranean operations, solutions would have to be found to the problems of shipping and landing craft and to the provision of adequate fighter air cover. Marshall wanted Voroshilov to understand that at present the United States had landing operations going on at five different places in the Pacific, all of which involved landing craft, and that four more were scheduled for January. The least interference with OVERLORD would result if the Allies confined themselves to reduced operations in the Mediterranean for the next three or four months. plies and equipment. Steps were being taken to speed up landing craft construction in both the United States and the United Kingdom. At one point in the discussion, Voroshilov went so far as to ask Sir Alan Brooke bluntly whether he considered OVERLORD as important an operation as General Marshall indicated he did. General Brooke replied that he considered OVERLORD vitally important, but added that he was familiar with the defenses of northern France and did not want to see the operation fail, as it might under certain circumstances. Marshal Voroshilov commented that Marshal Stalin and the Soviet General Staff attached the greatest importance to OVERLORD and felt that operations in the Mediterranean could only be regarded as auxiliary. Marshal Stalin, he added, insisted on the execution of OVERLORD on the date already planned. On this optimistic but inconclusive note the military meeting adjourned. Later in the day the military gave their report to the chiefs of state, who had assembled once more. 37 At this point, Marshal Stalin asked who was to be the commander of Operation OVERLORD. When the President and Prime Minister replied that the decision had not yet been made, Stalin immediately declared, "Then nothing will come out of these operations." The Prime Minister pointed out that his government had already expressed its willingness to accept an American as commander and that he agreed it was essential to appoint a commander for OVERLORD without delay. Such an appointment, he indicated, would be forthcoming within a fortnight. Italy by amphibious turning movements; second, capture Rhodes, in conjunction with Turkey's entry into the war; and third, launch operations against the southern coast of France in order to help OVERLORD. He acknowledged that such a force in the Mediterranean could not be supplied without either postponing OVERLORD six or eight weeks, or withdrawing landing craft from the Indian Ocean. Again he pleaded for aid to encourage resistance in the Balkans and stressed the importance of Turkey's entry into the war. Again Stalin was adamant. He wanted no postponement of OVERLORD; it must be executed "by the limiting date." In comparison with OVERLORD, Turkey's participation, Rhodes, and the Balkans were relatively unimportant. All operations in the Mediterranean other than that against southern France would be mere "diversions." What had to be determined, he insisted, was the commander for OVERLORD, the date for OVERLORD, and the matter of the supporting operations to be undertaken in southern France in connection with OVERLORD. To relieve the tension that was building up and bring the matter to some conclusion, the President, who until then lead contributed little to this discussion, took a hand. As he saw it, all three seemed to be agreed that the Anglo-American staff should be directed to go ahead on the assumption that OVERLORD was to be the "dominating operation." While the Combined Chiefs of Staff might recommend subsidiary operations in the Mediterranean, nothing should be considered that might delay OVERLORD. 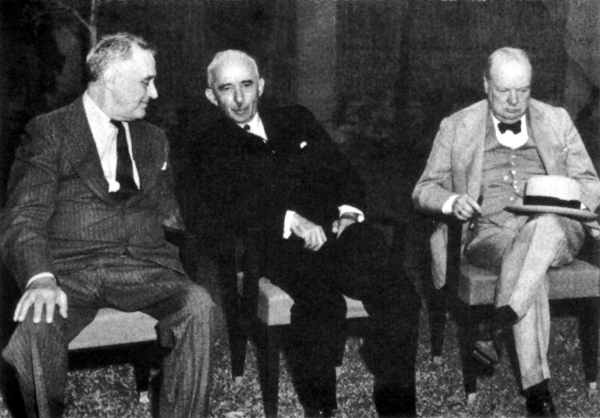 It was typical of the President at Tehran to act as arbitrator, if not judge, between the other two leaders who were as different in their methods as in the views they represented-Churchill, the master orator and debater, skilled both in words and parliamentary maneuvers; Stalin, "the man of steel," disdainful of the debater's artifices and diplomatic niceties, terse, blunt, and relentless in his refutation. The President did not appear completely indifferent to Churchill's eloquence and persuasiveness and to the possibilities of Mediterranean ventures, particularly in the Adriatic 38 But at the same time he was under strong pressure from his military advisers that nothing must delay OVERLORD, and in the end he held through. a two-division assault launched from Corsica and Sardinia, building up to ten divisions. Optimistically, if vaguely, it assumed that the landing craft and the resources would probably be available.45 It was on the basis of this study that the Americans and the British, urged on by the Russians, committed themselves at Tehran to a southern France operation. The conference now moved swiftly to a close. 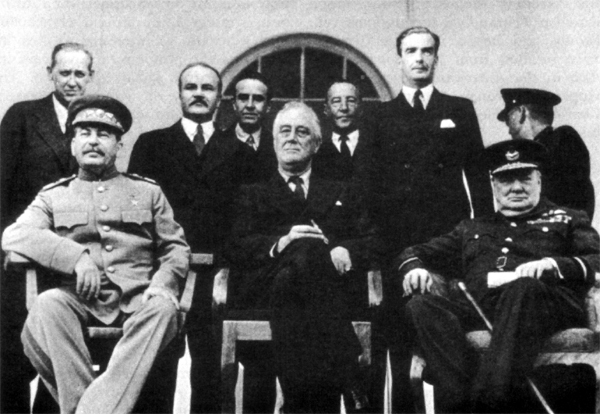 On the afternoon of 30 November Roosevelt, Churchill, and Stalin accepted the report of the Anglo-American staffs. Stalin agreed to time his offensive on the Eastern Front to coincide with the launching of the attack in the West in May 1944. The President promised that he and the Prime Minister would take up the matter of a supreme Allied commander and make a decision within the next three or four days. The military conclusions of Tehran were embodied in a document signed by the President, the Prime Minister, and Marshal Stalin on 1 December. In addition to the decisions concerning the second front, the three heads of state agreed to support the partisans in Yugoslavia with supplies and equipment and commando raids. In response to Churchill's plea, they also agreed to make another effort to induce Turkey to enter the war. , Stalin even promised that if Bulgaria attacked Turkey, as a result of Turkey's becoming an active participant in the conflict, the USSR would immediately declare war on Bulgaria. Henceforth, the military staffs of the three powers were to keep in close touch on the forthcoming operations in Europe. To mislead the enemy about these operations, a cover plan was to be concocted by their staffs. THE COMBINED STAFFS MEETING IN MENA HOUSE, 4 .December 1943. Left from front: Commander Coleridge, Sir Hastings Ismay, Admiral of the Feet Sir Andrew B. Cunningham, Sir Alan Brooke, Sir Charles Portal, Sir John Dill, and Brigadier Redman. Right from frond: Admiral .ding, Admiral Leahy, Captain Royal, General Marshall, and General Arnold. Swiftly upon the close of the Tehran conference, which had seen the Big Three in the coalition against Germany forge new bonds of unity, a tripartite declaration of importance to the coalition partners against Japan was released from Cairo. The Cairo Declaration, issued on 1 December, set forth Anglo-American-Chinese war aims earlier agreed on by Churchill, Roosevelt, and Chiang Kai-shek at Cairo. According to this definition of policy, the three Allies in the war against Japan were fighting to "restrain and punish the aggression of Japan." Disclaiming any desire of gain for themselves, they announced their intention to strip Japan of all the islands in the Pacific that it had seized or occupied since 1941. Territory "stolen from the Chinese," including Manchuria and Formosa, was to be restored to China, and "in due course Korea shall become free and independent. "51 The Cairo Declaration, added to the general political understandings of Tehran, gave further proof that the powers allied in the respective coalition efforts against the major foes were beginning to grapple seriously with the problems of territorial settlement and the shape of the postwar world. On 1 December the Combined Chiefs of Staff and on 2 December Churchill, the President, and Admiral Leahy left Tehran by plane for Cairo and the concluding meetings of the conference. Despite the unexpectedly favorable turn of events at Tehran, there was still unfinished business with the British at Cairo. Discussion of the question of an amphibious operation against the Andaman Islands and the whole matter of the Pacific war was pending. Outstanding Anglo-American military problems in the war against Germany also remained for settlement. Resources had to he examined and command adjustments made. Hanging fire was the question of an Aegean Sea venture. Still pending were politico-military problems of Turkey's possible entry into the war and the prospective zones of Germany to be occupied by British and U.S. troops. In Cairo, the Combined staffs spent five busy days locked in debate. As events showed, there was good reason for. With substantial agreement reached on the European operations and Rhodes receding in importance, attention now focused on the question of the Far Eastern operations. Attempts to reconcile the divergent British and American staff views continued to prove fruitless, and Marshall suggested to the JCS that the President and Prime Minister should be informed of their differences. In Marshall's opinion, when the tremendous efforts involved in the preparations for the Burma campaign were considered, "a failure to mount it would constitute a loss, which . . . was equivalent to a reverse." 58 Marshall's concern was not directed at the amphibious operations alone, for lie told the Combined Chiefs that "if it were possible to abandon the amphibious operations and still do the North Burma campaign, he personally would not be seriously disturbed." 59 Marshall and the other U.S. Chiefs of Staff were not eternally wedded to BUCCANEER, but were firmly convinced that without such an amphibious operation, Chiang mould not commit his forces in Burma. The British, on the other hand, asserted their intent to conduct north Burma operations even without Chinese participation and played down the value of the expected Chinese war effort. At any rate, the JCS, much to their disappointment, had been overruled and the British had won their point. European operations were to be strengthened at the expense of the CBI, and as a result the role of China in future plans was on the decline. The Presidential decision was the turning point for China and its importance to the Allies in the war. The promise of China was now to be replaced by the promise of the Soviet Union as the valuable ally in the Far East. At the close of SEXTANT the status of CBI plans, aside from BUCCANEER, was much the same as it had been at the opening-undecided. Mountbatten and his staff were still investigating alternatives. Chiang was on the verge of accepting the President's alternate suggestion that he should do nothing until November and of requesting more aid in the meantime. Although small units of the Chinese Ramgarh force were in contact with the Japanese in north Burma, the prospect for early offensive operations appeared rather forlorn at the close of SEXTANT. The military situation in the Pacific in November showed that, although Allied efforts to contract the perimeter of the Japanese empire had made little headway in terms of regained territory, the enemy's position was far from enviable. The attrition suffered by Japan's naval, air, and merchant shipping resources had been heavy and would increase as Allied naval and air superiority became more marked. It was the threat of things to come as more Allied resources became available rather than the anticipated effects of current operations that produced an optimistic attitude in Anglo-American planning circles. Some of the optimism that was beginning to pervade Allied thinking on the war against Japan was evident in the over-all plan submitted by the Combined planners at SEXTANT. They were not certain at this point that the invasion of Japan would be necessary, since sea and air blockade coupled with intensive air bombardment might defeat Japan. They also foresaw the possible fall of Germany as early as the spring of 1944, and, should this occur, they thought that the USSR might enter the war against Japan shortly thereafter. Because of the possibility of an abbreviated war, they recommended that the main effort in the war against Japan be made in the Pacific, using both the Central and the SWPA axes, with the objective of reaching the Formosa-China--Luzon area rather than Hokkaido by the spring of 1945. To support this main drive, subsidiary operations would be carried on in the north and south Pacific, China, and SEAC. Insure that the sequence of operations remains flexible and that preparations are made to take all manner of short cuts made possible by developments in the situation. would be a sufficiently large British naval force in the Indian Ocean to take care of any Japanese threats. All other available British naval units should be concentrated in the Pacific, provided they could be supported logistically and could be employed usefully. British forces used in the Pacific should be based in the Bismarck-Solomons area so that they could support either the SWPA or the CPA offensive.69 Acceptance of this recommendation would mean that eventually British naval participation in the Pacific phase of the war would become larger and that the British would probably expect a greater role in the making of strategic decisions. other Allies in this area was in the offing. Moving from the general to the specific, the United States proposals for definite operations during 1944 set forth the same over-all objectives that the combined plan contained and then went on to outline action foreseen for the coming year. In the north Pacific preparations for long-range strategic bombing against the Kurils and northern Japan would be continued, and plans for entry into the Kurils and the maritime provinces should be made in the event that the USSR collaborated. The advance along the New Guinea-Netherlands Indies-Philippines axis should proceed concurrently with the drive against the mandated islands. B-29's would be based in the Marianas to bomb Japan. Air attacks on Netherlands Indies and Philippines- targets and air bombardment to neutralize Rabaul would be intensified. Increases in operations and forces, especially air forces, in China were visualized, and the Super-fortresses based in India and China would be pre pared to strike at the Japanese homeland. The schedule of operations stressed four factors that might allow short cuts to be taken and accented the need for flexibility: (1) the early defeat of the Japanese Fleet; (2) the sudden withdrawal of Japanese forces from certain areas, as had happened at Kiska; (3) increases in the Allied assault shipbuilding program and defeat of Germany earlier than October 1944; and (4) early collaboration of the USSR in the war against Japan. The proposed timing and sequence of planned operations for 1944 followed. (See Table 2.) A comparison of this schedule with the one submitted at QUADRANT reveals several significant changes in Pacific planning.73 In the first place, the timing for most operations had been accelerated by one or two months. Secondly, capture of the Marianas, a planning objective approved by the JCS during the trip from the United States to Cairo, had been set up in place of the Palaus operations for October 1944. The development of the B-29 had made the potential air bases in the Marianas of much greater importance than before, and attacks on the Japanese homeland were expected to begin at the end of 1944. Lastly, only in Burma were operations to be postponed and reduced in accordance with Anglo-American decisions.74 If Burma could be discounted or ignored, the outlook for Pacific operations was optimistic. Source: CCS 397 (rev), 3 Dec 43, title: Specific Operations for the Defeat of Japan, 1944.
devoted to the Pacific line of approach. Whatever the ultimate political implications, the relegation of China to a secondary role seemed to coincide with the estimates of the Army strategic planners and would perhaps permit a more realistic assessment of the over-all strategic picture. OVERLORD and ANVIL-- the "Supreme Operations"
The main outcome of the concluding Anglo-American military discussions in Cairo was the confirmation of OVERLORD and ANVIL as the "supreme operations for 1944." Nothing was to be undertaken in any part of the world to jeopardize their success. This basic decision of SEXTANT-EUREKA enabled the combined staffs to reach a number of important supplementary agreements regarding operations in the war against Germany.76 Ways and means to increase the strength of the OVERLORD assault were to be examined constantly. The Combined Bomber Offensive was to continue to have the highest strategic priority, with no change in plan except for a periodic revision of bombing objectives. The operations of the Eighth Air Force were to be intensified as fast as available planes and crews would permit. The Anglo-American staffs agreed that the necessary military co-ordination with the USSR should be arranged through the United States and British missions in Moscow. Experts would be sent from Washington and London to co-ordinate cover and deception plans with the Soviet staff. ISMET INONU, THE PRESIDENT OF TURKEY, with the President and the Prime Minister, 5 December 1943.
theater was directed to submit a plan in consultation with COSSAC.79 The operation against southern France was to be planned on the basis of not less than a two-division assault, to take place about the same time as OVERLORD-May 1944. The commander in chief of the Mediterranean was to furnish additional support to the partisans in the Balkans in the form of food, clothing, raids, and air operations. In Italy the advance was to be governed by a limited objective the Pisa-Rimini line. Thereafter, pressure would be exerted on the Axis so far as possible without jeopardizing resources for ANVIL. Operations in the Aegean, in particular the capture of Rhodes, were labeled "desirable" by the CCS, provided they could be fitted into the schedule without detriment to OVERLORD and ANVIL-a far cry from the position that the Prime Minister had upheld during most of SEXTANT. to active participation in the war. The ensuing political talks with Turkish leaders, in some of which the President joined with the Prime Minister, again proved inconclusive, and the Prime Minister bowed to the inevitable. By December the Anglo-American authorities felt that the over-all. situation had changed so fundamentally that a much smaller scale of assistance than that provided in the HARDIHOOD agreement of the spring of 1943 would be necessary. The British proposed a reduced scale of aid-Plan SATURN. As usual, the Turks wished to make certain that upon their entry into the war they would be strong enough to defend their homeland; they doubted that the new plan would fully meet their security needs. 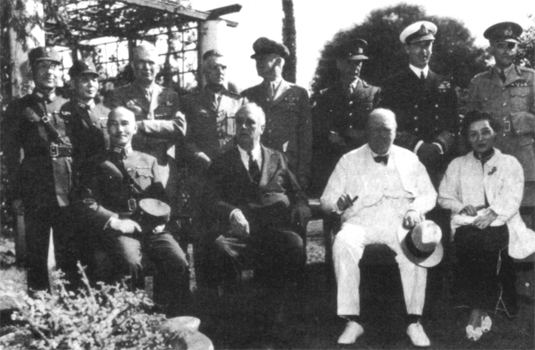 Churchill, faced with OVERLORD only six months away, reluctantly concluded that the resources demanded and the time required for strengthening Turkey could not be conceded.80 The U.S. Chiefs of Staff and their planners could feel relieved that this possible threat to concentration on OVERLORD had at last been removed. They were reassured that the attractions of eastern Mediterranean ventures for the British would not divert vital strength and means from the main undertakings. Clearing the air on questions of operational strategy against Germany helped settle a number of command problems that had been hanging fire. The British remained opposed to the U.S. proposal for an over-all European command.81 Both sides were nevertheless able to agree on the unification of command in the Mediterranean. According to the arrangement worked out, the Commander in Chief, Allied Forces, was to assume command of all operations in the Mediterranean, including the Balkans, Aegean Islands, and Turkey. To execute approved operations, he was authorized to transfer forces from one part of the Mediterranean to another, and for operational purposes the British command in the Middle East was brought directly under his orders. The British and U.S. forces allocated to him from the Middle East were to be determined by the British and U.S. Chiefs of Staff, respectively. The new arrangement for Mediterranean command was to take effect 10 December 1943.82 The Americans could now more cheerfully accept the projected step that promised to draw commands and forces more closely to the accepted strategic pattern. From the American point of view, the pieces were being moved into position on the Allied strategy chessboard, and the Middle East, as well as the remainder of the Mediterranean, at last was to assume a proper supporting role to the main moves on the Continent. "acceptance" at Cairo of the American proposal for a unified command of U.S. strategic air forces in the Mediterranean and northwest Europe. This was a modification of the original proposal to unify all the British and U.S. strategic air forces against Germany. Despite their vigorous objections "in principle," the British concluded that the question required an American decision. The Americans decided to put their plan into effect forthwith. A "United States Strategic Air Forces in Europe" was to be established, effective 1 January 1844. Consisting initially of the Eighth and Fifteenth U.S. Army Air Forces, its headquarters was to be in the United Kingdom. To make the step more palatable to the British, the JCS agreed that, pending future decisions on the control of all strategic air forces in connection with OVERLORD, the Chief of Air Staff, RAF, should continue to act as co-ordinating agent for the CCS. Under his direction, the U.S. air commander would be responsible for determining target priorities, tactics, and techniques employed; he could also move units between the theaters.83 On 8 December General Arnold informed General Spaatz that Spaatz was to head the new command. A more direct link-up-via the American air effort-between the Mediterranean and northwest Europe, in anticipation Of OVERLORD, was thus provided. drafted a note, which the President dispatched to Stalin, announcing Eisenhower's appointment.88 And so the matter was finally settled. Eisenhower would command OVERLORD, a British commander would take over in the Mediterranean, and Marshall would remain in Washington. At the last Cairo meetings the American military and naval planners were engrossed - as indeed they had been throughout the conference-in an examination of Allied resources to implement the desired strategy.89 The shortage of landing craft-by far the most critical and on which all operations turned called for delicate balance in meeting the global requirements. The word that came from Washington in response to the President's request as to the possible expansion of the landing craft construction program in the already overcrowded shipyards and busy factories was not encouraging. Increases did not promise to become appreciably effective in time to meet the OVERLORD date.90 Despite this discouraging outlook, the report of the combined logistics experts to the CCS showed an augmentation in the planned allocations in assault lift for OVERLORD and ANVIL. Most of the increases for OVERLORD, especially in critical LST's, had already been announced by King to the CCS on 5 November and were simply confirmed at Cairo. Some LST's for ANVIL were to become available because of the cancellation of BUCCANEER, some were to come from the Pacific allocations, and the rest were to be gathered from miscellaneous sources.91 The previous CCS instructions to return the sixty-eight LST's from the Mediterranean to the United Kingdom by 15 January 1944 remained unchanged.92 Some LST's to come from the United States for ANVIL had previously been planned for use in the Truk operation in July, but the planners expected that by pooling landing craft within the Pacific areas the Truk operation need not be delayed. From SEXTANT, Marshall and King both sent word that Army and Navy commanders all over the world should scrutinize their landing craft situation with an eye to making the vessels available for "the maximum battle effort. "93 In the next few months, Army and Navy planners would continue their intensive and wearisome search for the precious craft-calculating and recalculating, putting a few here, taking a few there. The spate of decisions with which SEXTANT ended brought to a close two years of wartime staff discussion and planning. The Allies had finally agreed upon a plan to defeat Germany-one that promised to carry out the concept of "beating Germany first." In retrospect, SEXTANT was the most decisive of the big military conferences of midwar. If, in planning for the offensive phase of coalition warfare against Germany, TRIDENT symbolized for American strategists a half-way mark, and QUADRANT the start of the final lap, SEXTANT represented the reaching of the goal. Germany-a "decisive" war waged with minimum losses, expense, and time. But, as usual in coalition warfare, no one staff gained all its desires. All the main threads in operational strategy of 1943-Burma and Pacific, as well as the cross-Channel and Mediterranean-had converged at SEXTANT. The result from the Army point of view was somewhat unexpected. In the process of winning -with Soviet support-its European case, the United States lost out on part of its strategy in the war against Japan. In order to gain its desires in the war against Germany, the American staff had to yield on its plans and hopes for the CBI. What started for them as a showdown on European strategy became a conflict over the strategic significance of operations in southeast Asia. One of the consequences was the indication of new directions in the China-Burma-India theater. The same pressures that pinned the British down to OVERLORD and ANVIL-the need for concentration of resources for the invasion of France produced a chain reaction resulting in their steadfast refusal to acquiesce in using scarce landing craft in SEAC. The Soviet announcement at Tehran of unequivocal support for OVERLORD-ANVIL directly weakened the British position on European strategy, while its pledge to enter the war against Japan weakened the American case on the role of the CBI. As usual, the divergent British and American cases were most clearly reflected in the stands taken by the familiar protagonists and skilled advocates -Churchill and Marshall. Churchill argued for further Mediterranean operations, especially in the eastern Mediterranean, even at the expense of a delay in OVERLORD, and wanted no major under- taking in the CBI. Marshall wanted nothing to delay OVERLORD and no eastern Mediterranean operations and advocated an active campaign in Burma. The President stood between the two. Wavering toward the Adriatic and anxious to support China as strongly as possible, Roosevelt ended by putting his full weight behind OVERLORD-ANVIL and reversing himself on China. To get the scheduled cross-Channel operation he wanted and to stay out of the eastern Mediterranean, Marshall had to yield on the Burma operation. But other factors -aside from scarcity of landing craft, British objections, the Soviet announcement, and the President's reversal would undoubtedly have made him concede anyway. He wanted to bring the war against Japan to an end as quickly as possible; the ceilings on Army manpower threatened to impose limits to U.S. efforts everywhere, and, as always, the problem of the strategic reserve had to be considered. The promise of the USSR implied bases and manpower, and American planners had begun to discount Chinese capabilities of becoming ready for a major offensive shortly after the defeat of Germany. Marshall and his staff had to recognize that much of the thinking about using Chiang's manpower and bases had been wishful. Above all, they had begun to recognize that the Pacific promised the fastest approach to defeating Japan. the desire to end the war with the least expense in men, money, and time-it was not too surprising that a big operation on the Asiatic mainland would go by the board. It fitted in least well. OVERLORD was on a narrow margin, and the CBI was at the farthest end of the supply line. To keep open a line of communications to support a major campaign in the CBI-even if few U.S. combat troops were actually employed in it -might eventually have put a considerable strain on American manpower and resources. In U.S. military terms, it was the most expendable of operations. The issue was argued out at SEXTANT in military terms and especially in terms of specific shortages. At stake was the fate of OVERLORD. The upshot was that the Americans yielded on the Burma campaign, the British on the eastern Mediterranean operation. As it turned out, the decision to forego a large-scale operation on the Asiatic mainland-presaged at SEXTANT-was no big dramatic decision. Rather, it was a negative one of default. But it was undoubtedly one of the most important for the war, and, it may be argued, for the postwar period as well. The year 1943 had begun with an indecisive conference at Casablanca, merely confirming that the Pacific and Mediterranean trends would continue. The cross-Channel and Burma operations had simply been left up in the air. No acceptable basis for dividing and relating the efforts against Germany and against Japan had been established. Gradually, in and out of the 1943 conferences, the Mediterranean trend had been tempered and at SEXTANT definitely tied to a scheduled cross-Channel operation. Though relatively few U.S. troops had been sent to the CBI, that theater had figured as a major element in 1943 discussions and plans. The conference that put the capstone on European strategy marked the beginning of the decline of the CBI in Allied strategy. The equation of matched Mediterranean and Pacific advances, never explicitly stated, that had held through 1943 in Anglo-American planning, was at an end. So too appeared to be the abortive 1943 formulas to link the war against Japan to the war against Germany. Two years after Pearl Harbor the Allies had still not reached agreement on a plan to defeat Japan, but SEXTANT made clear that Allied attention in operational planning for 1944 would focus on the Pacific as well as OVERLORD. What the general pattern of strategy to defeat Japan would be and whether any greater success in relating the two wars would be achieved remained for the future to disclose. confined, as in conventional U.S. military practice, to the military aspects of questions at issue. In fact, however significant the conference was for American foreign policy, SEXTANT confirmed that the American staff was fighting and would continue to fight the war in military terms, and in terms of decisive military victory. Nothing decided at the conference would impel the U.S. staff to interpret the unconditional surrender concept-first publicly announced at Casablanca-as anything essentially different from the military objective of fighting a decisive war. Whatever the President's political objectives in the war and his ultimate aims for the postwar world, it is evident that he, like his staff, wanted the war over as quickly and decisively as possible and that he acted at SEXTANT on that basis. As usual, his precise motivation is less clear. This approach to the war may have represented the impact of his staff's ideas. It may have reflected the need for a simple common denominator in reconciling coalition partners fighting with different political aims and the hope thereby more quickly to gain his own ultimate ends. Perhaps it was no more than the traditional abhorrence of long wars and consequent compulsions of domestic politics in a democracy. Perhaps it was a complex of such influences. Historians of the presidency must provide the answer. In the final analysis, SEXTANT marked the beginnings of a realignment of power within the Allied coalition, the significance of which, for the postwar political balance in Europe and Asia, remains to be definitively studied.97 In the war against Germany, the USSR for reasons of its own put its weight behind American strategy and, confident of its capabilities, asserted its full power as an equal member of the coalition vis-�-vis the United States and the United Kingdom. Long before the USSR or the United States joined the war against Germany, Great Britain's forces had been locked in mortal conflict with the Nazi military might. In the first year and a half after Pearl Harbor, while the United States was gathering its strength and the USSR was largely engaged in a desperate war for survival, British ideas on fighting the European war had tended to prevail over those of the U.S. staff. But in1943 Great Britain was fully mobilized, and its position in the coalition vis-�-vis the United States, growing stronger and more skilled in the arts of coalition warfare, had gradually been leveled in 1943. In calling the final tune on European strategy at the end of 1943, Great Britain yielded to two powers-the one from the New World, .the other from the East-who were to supply the bulk of the military manpower for defeating the German forces on the Continent. In the war against Japan, China began to he counted as less important. The USSR, which pledged itself to enter that conflict, gave promise of taking up the slack. Participation by the USSR was to appear more desirable than ever to the Western Allies. At the same time, the British served notice once more of their own desire for a larger share in the war against Japan. This emerging shift in the Allied balance of power was to provide a new planning environment for the Army staff during the remainder of the war. that the two strong protagonists-Marshall and Churchill-would remain at the helm and play out their roles in Anglo-American global strategy. Fittingly also, General Eisenhower, who had shown great adaptability and tact in welding the forces of the two countries in the field and had developed from a U.S. staff officer into an outstanding Allied commander, was to emerge as the commander of the key operation-OVERLORD-itself a compromise between the original desires of the two global chiefs and their staffs. Eisenhower's projected return to the United Kingdom symbolized the end of the flux that had characterized Anglo-American strategy since the end of 1942 and a shift in coalition warfare back to the track long desired by the Americans and for which they had struggled so hard through 1943. General Eisenhower, who had been so instrumental in fashioning the Army's BOLERO-ROUNDUP plan and who had gone over to the United Kingdom in June 1942 to prepare for the cross-Channel operation, had, ironically, been heading the Mediterranean campaign since the fall of 1942. He had brought the advance in the Mediterranean to a point where it finally seemed to be within controllable limits and at the close of 1943 prepared once more to return to the United Kingdom, this time destined to stay until victory was won. On 18 December the President announced to Stimson, " `I have thus brought OVERLORD back to you safe and sound on the ways for accomplishment.' "98 Stimson and Marshall and his advisers had every reason to feel that their long struggle to reach a firm understanding with the President, the British, and the Russians had finally been crowned with success. Much water had passed under the bridge since their first attempt in the spring of 1942 to gain a decision for a cross-Channel operation. The road had proved longer, the processes more complicated, the windup somewhat unexpected, and the final plan different from what they had originally envisaged. All this was behind them. Much hard work remained to he done both in Washington and in London to carry out the decision, but the Army staff now looked forward with confidence to the early and decisive Allied victory on the European continent for which they had hoped and planned so long.